Paper Doll Romance: The Sixth Day of Christmas Winner! On the Sixth Day of Christmas, PDR gave to Jacky... some all natural, earth friendly goodies from Mary of Heaven and Earth, LLC. Jacky will receive an assortment of all natural items from Heaven and Earth which includes all homemade, natural, healthy items: homemade citrus bath salts made with dead sea salts, essential oils, and orange zest wrapped in a reusable muslin sack, homemade citrus soap wrapped in eco-chic post-consumer and recyclable materials, and a hand crocheted cotton washcloth. Heaven and Earth is a family owned and operated business, based out of NJ, that is committed to doing their part to help the environment and live a sustainable lifestyle. They utilize recycled materials for packaging and their products are all earth friendly, vegan, chemical-free and dye-free making them perfect for healthy living. Plus, their soaps smell great, look like yummy little desserts, and often include ingredients like coconut, oatmeal, and poppy seeds that act like a natural exfoliator. 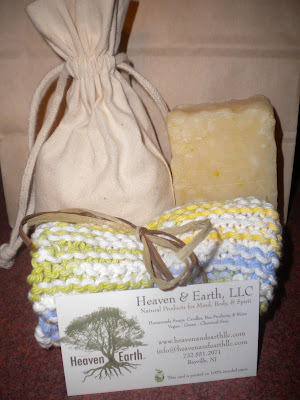 Be sure to check out the other items from Heaven and Earth on their website, follow Mary and the Heaven and Earth team on their journey to a more sustainable lifestyle on their blog, or become a fan of Heaven and Earth, LLC on Facebook for earth friendly updates and info on their great products. Thank you to Mary andHeaven and Earth for their generous donation. We wish you much success and, of course, the happiest of holidays. Congratulations to Jacky on winning this fantastic gift set - please email us with your shipping address so that we may let Heaven and Earth know to ship it out to you.